The leader of a dissident Irish Republican Army faction was sentenced to 20 years in prison Thursday for directing a group involved in the deadliest single explosion in Northern Ireland's three decades of violence. Michael McKevitt, 53, also drew a six-year concurrent sentence for membership in an outlawed organization — the so-called Real IRA. He refused to attend the sentencing but indicated he plans to appeal. "The accused played a leading role in the organization which he directed and induced others to join," said Justice Richard Johnson, one of three judges who found McKevitt guilty Wednesday on both counts. The Real IRA was one of two dissident groups blamed for the Aug. 15, 1998, bombing in Omagh in which 29 people were killed and more than 200 injured. McKevitt was not convicted of any offense connected with the attack. Ireland made it a crime to direct terrorism in reaction to that bombing. The prosecution's key witness was David Rupert, an American trucker who was recruited by the FBI in 1994 to penetrate Irish extremist groups. The FBI paid him $1.25 million for his undercover work. McKevitt dismissed his legal team on July 24 after it had thoroughly cross-examined Rupert, suggesting he was a serial criminal who would do anything — including lying about McKevitt — for money. He refused to participate in what he called a "political show trial" after firing his lawyers. Histories of the Sinn Fein-IRA movement identify McKevitt as a longtime officer in the IRA, which killed about 1,800 people during a 27-year campaign to abolish Northern Ireland as British territory. His wife, Bernadette, is the sister of Bobby Sands, an IRA man who was elected to the British parliament while on a hunger strike in 1981. Sands died after a 65-day fast. McKevitt reportedly formed the Real IRA in protest at the IRA's decision in 1997 to abandon its campaign in favor of peace talks that produced the Good Friday 1998 agreement. The group bombed more than a dozen Northern Ireland towns that year, culminating in the attack at Omagh. The Real IRA, also known as the True IRA, is a member of the State Department's list of foreign terrorist organizations. The other group believed involved in the Omagh attack was the Continuity IRA. It broke off from the mainline IRA even earlier, during the larger group's short-lived 1994 cease-fire. 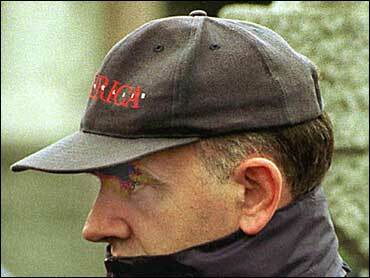 McKevitt's conviction could counter bad press that has dogged the investigation into the bombing. Only one man has ever been arrested, charged or convicted for actually carrying out the Omagh attack. Colm Murphy was convicted last year with conspiracy to plot the bombing. A British investigation found in late 2001 that warnings about the impending Omagh attack were ignored or not passed on to the proper authorities.